Centre for Learning » No hiccups here! 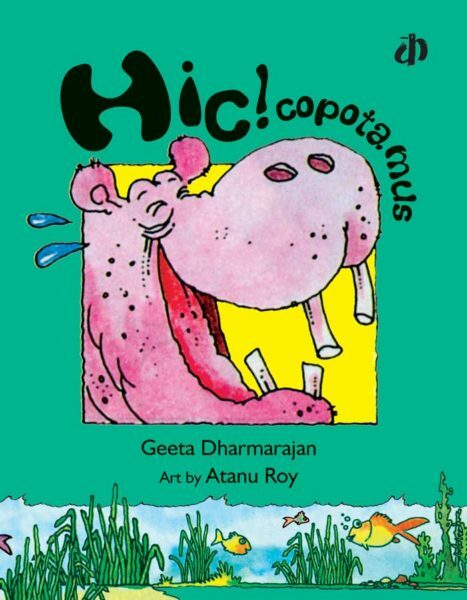 The inimitable pair of Geeta and Atanu have turned their talents to bring out a book to laugh with. The usual sounds of the Gulmohar Jungle are rudely disturbed one morning by something gigantic sploshing into the Lily Pond. What in heaven could it be? The rest of the story is pure fun and can be enjoyed by children as they listen, take roles and enact the hilarious scenes. Atanu Roy shows his versatility in creating absurd and comical representations of the animals in the forest. Geeta Dharmarajan’s story line keeps the guessing game alive, and the participation of the animals and readers going at a good pace. The conversational style draws both younger and older readers alike. One trend that can be noticed in fiction for children these days is the inclusion of facts either at the end of the story or interspersed within the text. This does not always match the age group the story is intended for. But here it blends in well, probably because children are insatiably curious about animals. Altogether a book which children will relate to both in terms of animals they love and hiccups which are a source of delight to everyone except the sufferer! Usha Mukunda. usha.mukunda@gmail.com Oct. 29th 2014.